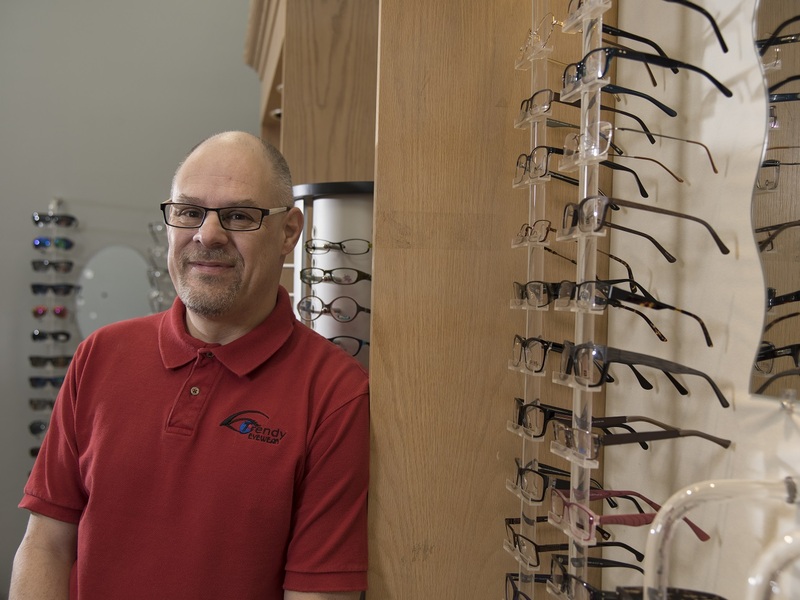 Tim LeBlanc is celebrating his fourth year as the owner of Trendy Eyewear located in Amherst. It’s been quite a journey for the 49 year-old, whose been working in the optical field since he was 20 years old. Although he didn’t realize it at the time, when Tim was living in Calgary during the 80s, he read an ad in the paper which said something like “Do you want to learn something new?” He responded. The upshot was that Tim learned the ropes about being a lab tech for a lens manufacturer. He then worked for the company doing everything from retail sales to managing the lab. At some point, Tim also worked directly for optometrists then went back to doing outside sales for the manufacturers. Eventually, growing weary of being on the road and waking up in a different room every morning, in 2009 he and his wife, Nancy, decided to head back to Amherst. “You can take the boy out of the Maritimes, but you can’t take the Maritimes out of the boy,” he says with a grin. Four years ago, Tim’s health took a turn. Facing the big question, “What do I want to do the rest of my life?” he came up with the answer, “Be my own boss.” Nancy concurred; it was time. When Tim first did his business plan, he wondered: “If the community supports me, how can I support the community?” So he looked for those who needed it the most—people on social assistance, and seniors. Currently he gives a senior’s discount, donates food to the Food Bank and provides other ways and means of assistance. After pausing for a moment, the successful entrepreneur tucks in, “I wish I had done this ten years ago!